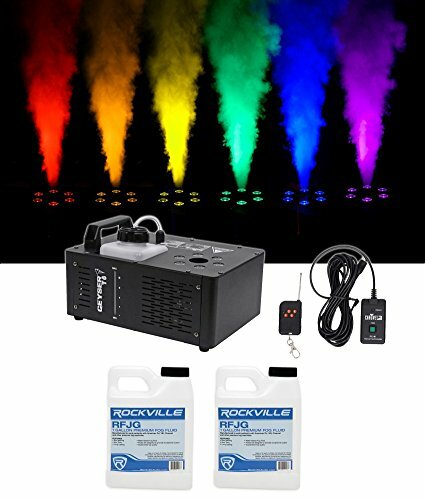 Chauvet DJ Geyser T6 Fog Machine Fogger, LED RGB Pyrotechnic Light Effect+Remote . Pyrotechnic-like effect without the use of any toxic chemicals, fire or heavy CO2 canisters. Multiple control options include wireless remote, timer remote or push button on rear. Assign different colors to each of the remote's buttons and the manual button. Lightweight and compact size makes it perfect for mobile applications. Digital display allows for easy configuration even in a fast paced environment. Advanced fluid sensor, with automatic shut-off protects the pump from overheating. LED-illuminated tank clearly shows remaining fluid level. Rockville RFJG Gallon Fog/Smoke Juice Fluid For Chauvet American DJ ADJ Machines. 1 Gallon. Non staining. Non Toxic. Long Lasting. Water Based Fog Fluid. Authentic Rockville fog juice. Rockville Fluids are designed and tested to provide exceptional output.. Lower end brands make bad quality fog juice which can damage your equipment, only use Rockville fluids!. Guaranteed top quality fluid. .